Sci-Fi for Cy Fi, Femme Fest, Secret Weapon, and Una Walkenhorst take Benson by storm this week and next. 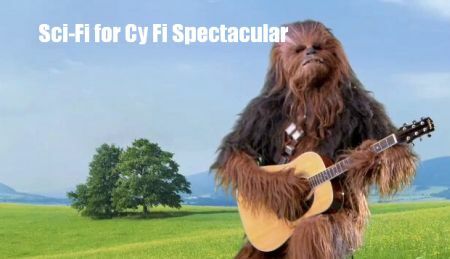 This Friday August 21st, the Waiting Room Lounge hosts the Sci-Fi for Cy Fi Spectacular, a benefit show for the Children’s Organ Transplant Association in honor of two brave women fighting Cystic Fibrosis. Alexis Stansbury and Meghan Zimmerman both received double lung transplants. Yes, double. If you can imagine the experience of having both your lungs replaced, just imagine the cost of doing so. The Sci-Fi for Cy Fi Spectacular will feature a great line up with the Sub-Vectors, All Young Girls Are Machine Guns, the SuperBytes, and Robo Dojo. The event will include a fund raising raffle with a galaxy of prizes as well as a costume/cosplay contest where participants can win various prizes including O Comicon Passes. Attendees are encouraged to dress up in sci-fi themed costumes, so there will surely be representatives from various alien planets, some Star Trekkies, a few Whovians, and probably a lightsaber battle or two. Recently Sam, Dave, and Tenton from the Sub-Vectors as well as Rebecca Lowry and Molly Welsh from All Young Girls Are Machine Guns stopped by the Worlds of Wayne studios to record a podcast promoting the event. We chatted about favorite sci-fi themes, Star Wars vs Star Trek (no blood was shed), and some of the details of the benefit. You can listen to the Worlds of Wayne interview and learn more about CY Fi and the brave women who received the transplants below.